Scooters. Lots and lots and lots (and lots) of scooters. Driving: not quite a free-for-all. Guys carrying purses. I mean, most guys. As in, the majority. Toilets: oh boy. 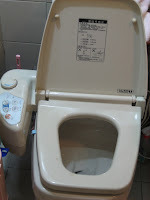 There are three kinds of toilets in Taiwan, as if in strange parallel to three different generations. First, you've got your "old school" squat toilets, still common in many rest stops, older restaurants and stores, and older buildings. I experienced these the last time I came to Taiwan, at the age of 12, and it is definitely something that takes getting used to. 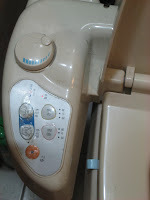 Complete with a set of controls on an armrest-like contraption, you can make the toilet seat warm (feels like someone just finished using it...), set a small jet of water going to wash your bum once you're done...the latest models will even play music to help set you in the right mood. This is a product of Japanese innovation, and Taiwan follows Japanese trend and culture with a certain maniacal fascination. The cleanest metro I ever did see. Its meticulous appearance is due to the very stringent laws against smoking, eating, drinking, or gum-chewing in place, with a hefty fine involved. 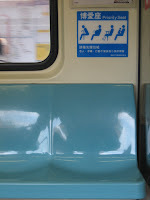 Final note about the metro: all station stops and messages are repeated in Mandarin, Taiwanese, another aboriginal Taiwanese dialect, and English. Taipei is a bustling, growing metropolitan city, and as such trends abound (and not just the ones involving bathroom appliances). The diversity of dress is comparable to that of New York City. The main difference? Lack of actual racial diversity. That said, I've seen many foreigners here, especially at the university where I'll be studying Mandarin. Food and shopping are the main activities here. This is apparent especially in the notable Night Markets of Taipei.